I recently got addicted to surfing Joss and Main at work. I love this site. It's a flash site for furniture. Sometimes you can find some really nice stuff for a decent price and it's nicer than Ikea! I am looking for a couch or chair for my apartment at school that I would take with me to my first big girl apartment. It's a struggle because I know what I like = something classic - but I want it to be fun! Most apartments wont let you paint and you have to bring in color somehow. Here's my ideal inspiration for my apartment when I graduate! 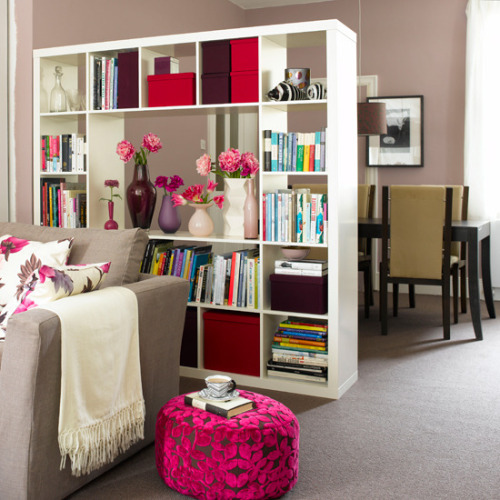 Bookshelves and Pink - can't get better than this if I don't live with anyone when I graduate.